The number of older Americans with driver's licenses rose from 2007 to 2011. Self-driving vehicles have the potential to make immobility among elderly people and those with disabilities a thing of the past, experts say. Declining vision and other physical impairments will no longer inhibit people from going out to eat or visiting their favorite stores, the experts say. In the meantime, companies such as Mercedes-Benz, General Motors, Ford and Toyota are laying the foundation for this future with adaptive cruise control, blind-spot monitoring, automatic braking and other semiautonomous functions that could benefit still-mobile seniors. "The systems that we have on our cars now that are more and more common -- backup aids, parking aids -- are building blocks toward automated driving," says Kristopher Spencer, a GM advanced technology spokesman. "We're going to see continuous acceleration of innovative driving systems coming to market." For instance, the 2014 Chevrolet Impala offers a crash-imminent braking system that uses radar to detect crash threats and alert drivers. If the driver doesn't react quickly enough, the system stops the vehicle automatically. The 2013 Toyota Camry and Avalon can help aging drivers who are less flexible than they once were with blind-spot monitoring and rear cross-traffic alert -- a function that sounds a warning tone when it senses an approaching car coming from the left or right rear while the driver is backing up at less than 5 mph. These technologies will enhance driving for all age groups, automakers say, but older drivers who tend to have more disposable income often will be the first to get them, says Joe Coughlin, director of the Massachusetts Institute of Technology's AgeLab. The lab researches how drivers across age groups react to new vehicle technology, including semiautonomous systems. In 2011, the share of new-vehicle buyers ages 65 to 74 rose 4 percentage points from 2007 to 13 percent of all purchasers, according to R.L. Polk data cited in a University of Michigan Transportation Research Institute study. New-vehicle buyers in the 55-64 age group made up 23 percent. The biggest group, those ages 45 to 54, accounted for 26 percent of new-vehicle purchasers. But even though the share of older new-vehicle buyers is increasing, don't expect marketing campaigns touting semiautonomous features aimed at older consumers, Coughlin says. One way to mangle the appeal of any good design, he says, is to define it as an "old man's car" because the young and old alike will stay away. "Really, what we want to do is define these technologies as easy, safe and convenient. These are ageless values that the older adult market will gravitate to without the sign out front saying this car was built for you," Coughlin says. 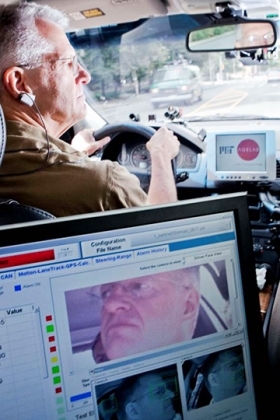 The Massachusetts Institute of Technology's AgeLab uses on-road vehicles and simulations to record driver data such as heart rate, eye movement and respiration. Older people who have relied on their driving instincts for decades are sometimes distracted by collision warnings, AgeLab found. Coughlin says that is because those drivers haven't learned to trust instruments that notice danger before they do. "If they hear a collision warning go off, they want to be able to see why it went off easily," he says. AgeLab uses on-road vehicles and computer simulations to learn how a person's physical condition affects skills such as parking ability, for instance. MIT's AwareCars, a fleet that includes the Lincoln MKS, gauge the physiological well-being of drivers. 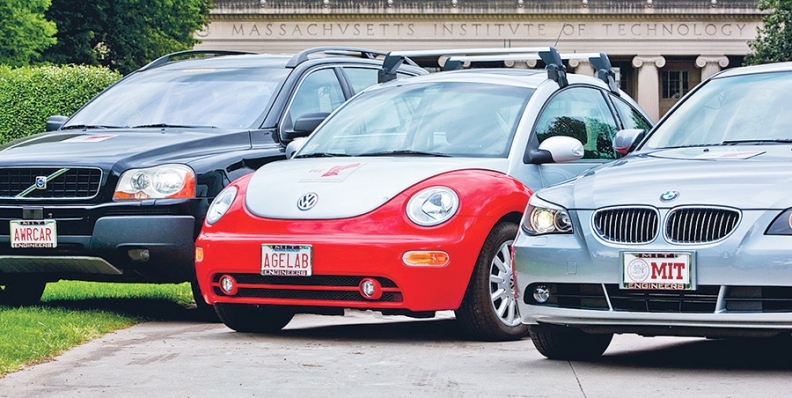 In addition to the AwareCars, MIT has a Volkswagen New Beetle dubbed Miss Rosie that records data measuring a driver's physical capabilities to operate a vehicle, such as flexibility and strength. And a simulator called Miss Daisy helps researchers determine how factors such as medication -- a key issue for older people -- influence motorists. "With an aging population, chronic disease is a very major part of what it means to be older and, painfully for me, that means anybody over 40. Chronic conditions quite often mean more medications," Coughlin says. "What we're working on, in part, is a vehicle that will be a platform to not only be able to monitor, manage and motivate safe driving, but be able to detect the well-being of the driver behind the wheel." Once vehicles with semiautonomous features become fully automated, laws may block some seniors and people with disabilities from riding alone at first, says Thilo Koslowski, an analyst at Gartner Inc., a tech research firm in Stamford, Conn.
Koslowski predicts the government will require people to have the ability to take control of fully autonomous vehicles in case something goes wrong, preventing those who are unable to drive on their own from using them. Mark Perriello, president of the American Association of People with Disabilities, says he hopes self-driving vehicles can be easily modified with hand controls or voice commands so people with disabilities can operate them. Automakers say their goal is to enhance the driving experience and make it safer with semiautonomous features, not replace drivers. Mercedes, which has tested autonomous technology since the mid-1990s, has made features such as collision-prevention assist and attention assist standard on most models. In September, Mercedes is advancing its offerings further with Intelligent Drive -- a collection of safety functions -- in the 2014 E class and S class. The German company's new stereo camera -- sporting two "eyes" with a range of 547 yards that create a 3-D view of an area up to 55 yards in front of the car -- will collect data for the safety systems in the latest E class and S class. The Intelligent Drive suite includes the Distronic Plus cruise control system, which has steering assist, active blind spot assist and lane keeping assist. Distronic Plus with steering assist uses short-, medium- and long-range radar to "read what is happening with the car in front of the driver, as well as two cars ahead," says Christian Bokich, a Mercedes spokesman. Bokich emphasized that these aids can help all age groups. "There are a myriad of standard and optional active and passive safety systems on most Mercedes-Benzes, even the most value-oriented ones like our new CLA coming in the fall," Bokich says. "Anybody buying luxury needs to justify that with a certain perk and benefit. We're offering safety as a key priority." Cadillac unveiled park assist in the early 2000s and later launched adaptive cruise control in 2004, forward-collision alert in 2005, and side blind-zone alert and lane departure warnings in 2008. Cadillac rolled out its advanced full-speed-range adaptive cruise control -- which slows or accelerates the vehicle to maintain a selected distance behind other vehicles -- in the 2014 Cadillac ATS, CTS, XTS and SRX as part of an optional driver assist package, GM's Spencer says. The package, which also has automatic collision preparation and rear cross-traffic alert, will be in the Escalade in 2015. Features such as park assist could be helpful to older people with a limited range of motion, Spencer says. "We always want the customer to know that we're not trying to replace them," he says. "These systems are there for their convenience." A Ford spokesman says the automaker introduced active park assist technology in 2009 for the 2010 Lincoln MKS sedan and Lincoln MKT crossover. In addition, the blind-spot system and forward-collision warning debuted for Ford on the 2010 Taurus and Fusion. Self-driving vehicles present a range of possibilities for older people and those with disabilities. In a new book, Future Ride, Peter Wayner writes that autonomous vehicles could free up social opportunities for seniors by acting as rolling adult day care centers that pick up friends. The book, which highlights 80 ways autonomous vehicles could alter society, was published in July. In the book's other scenarios, specialized self-driving vehicles could double as medical centers, providing basic services and allowing easy access for wheelchairs. Wayner says many people with handicaps no longer will need special parking spaces because autonomous vehicles will drop the people off in front of their destinations. Self-driving vehicles will make the lives of seniors and those with disabilities more social, Wayner says. "This may reduce the need for the number of assisted living facilities that are out there because they're going to be able to get around." The biggest barrier to self-driving vehicles is not the technology, but people's fears about having those with disabilities on the road, says Perriello of the American Association of People with Disabilities. But in reality, some people with disabilities are already driving with retrofitted vehicles that allow them to use hand controls, Perriello says. For people with disabilities, transportation can be a huge obstacle to handling routine tasks that many take for granted, but Perriello says a future with autonomous vehicles "holds a lot of hope" and will transform lives. Perriello says, "A self-driving car has the potential to provide one more avenue for people with disabilities to be a part of the American mainstream."